Below us, and rising against our position, was the mighty field of the glacier—a huge prairie, if I may term it so, of snow and ice, with vast irregular undulations, which gradually merged into an apparently smooth unbroken tract, as their distance increased. Towering in front of us, several thousand feet higher, and two or three miles away, yet still having the strange appearance of proximity that I have before alluded to, was the hugs Dône du Goûté—the mighty cupola usually mistaken by the valley travellers for the summit of Mont Blanc. 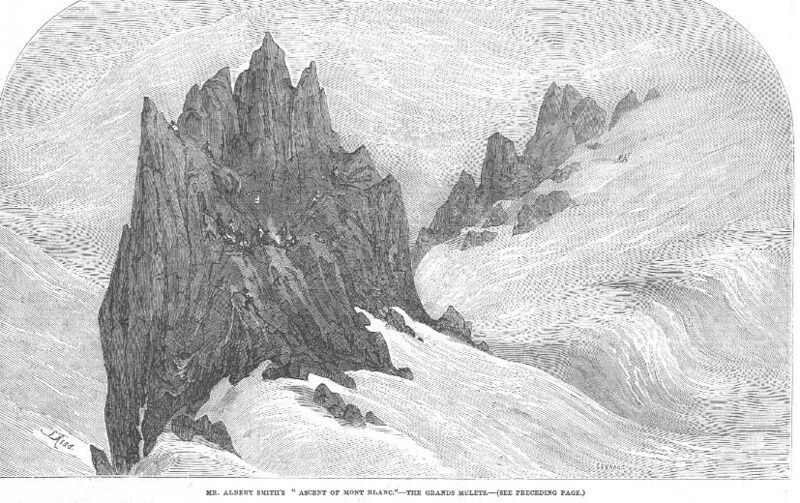 Up the glacier, on my left, was an enormous and ascending valley of ice, which might have been a couple of miles across; and in its course were two or three steep banks of snow, hundreds of feet in height, giant steps by which the level landing-place of the Grand Plateau was to be reached. The sun at length went down behind the Aiguille du Goûté, and then, for two hours, a scene of such wild and wondrous beauty—of such inconceivable and unearthly splendour—burst upon me, that, spell-bound and almost trembling with the emotion its magnificence called forth—with every sense, and feeling, and thought absorbed by its brilliancy, I saw far more than the realisation of the most gorgeous visions that opium or hasheish could evoke, accomplished. At first, everything about us—above, around, below—the sky, the mountain and the lower peaks—appeared one uniform creation of burnished gold, so brightly dazzling, that, now our veils were removed, the eye could scarcely bear the splendour. As the twilight gradually crept over the lower world, the glow became still more vivid; and presently, as the blue mists rose in the valleys, the tops of the higher mountains looked like islands rising from a filmy ocean—an archipelago of gold. By degrees this metallic lustre was softened into tints—first orange, and then bright, transparent crimson, along the horizon, rising through the different hues, with prismatic regularity, until, immediately above us, the sky was a deep pure blue, merging towards the east into glowing violet. The snow took its colour from these changes; and every portion on which the light tell was soon tinged with pale carmine, of a shade similar to that which snow at times assumes, from some imperfectly explained cause, at high elevations—such, indeed, as I had seen, in early summer, upon the Furka and Faulhorn. These beautiful hues grew brighter as the twilight below increased in depth ; and it now came marching up the valley of the glaciers until it reached our resting-place. Higher and higher still, it drove the lovely glory of the sunlight before it, until at last the vast Dône du Goûté and the summit itself stood out, icelike and grim, in the cold evening air, although the horizon still gleamed with a belt of rosy light. Although this superb spectacle had faded away, the scene was still even more than striking. The fire which the guides had made, and which was now burning and crackling on a ledge of rock a little below us, threw its flickering light, with admirable effect, upon our band. The men had collected round the blaze, and were making some chocolate, as they sang patois ballads and choruses: they were all evidently as completely at home as they would have been in their own chalets. We had arranged ourselves as conveniently as we could so as not to inconvenience one another, and had still nothing more than an ordinary wrapper over us: there had been no attempt to build the tent with batons and canvas as I had read in some of the Mont Blanc narratives— the starry heaven was our only roofing. F. and P. were already fast asleep. W. was still awake, and I was too excited even to close my eyes in the attempt to get a little repose. We talked for awhile, and then he also was silent. The stars had come out, and, looking over the plateau, I soon saw the moonlight lying cold and silvery on the summit, stealing slowly down the very track by which the sunset glories had passed upward and away. But it came too tardily that I knew it would be hours before we derived any actual benefit from the light. One after another the guides fell asleep, until only three or four remained round the embers of the fire, thoughtfully smoking their pipes. And then silence, impressive beyond expression, reigned over our isolated world. Often and often, from Chamouni, I had looked up at evening towards the darkening position of the Grands Mulets, and thought almost with shuddering, how awful it must be for men to pass the night in such a remote, eternal, and frozen wilderness, And now I was lying there—in the very heart of its ice-bound and appalling solitude. In such close communion with nature in her grandest aspect, with no trace of the actual living world beyond the were speck that our little party formed, the mind was carried far away from its ordinary trains of thought—a solemn emotion of mingled awe and delight, and yet self-perception of abject nothingness, alone rose above every other feeling. A vast untrodden region of cold, and silence, and death, stretched out, far and away from us, on every side; but above, heaven, with its countless, watchful eyes, was over all! We may safely leave the picture and this glowing description to commend themselves to the intelligent reader. Both, in their way, are right excellent works of art, and Mr. Smith rises in our estimation as an author, for having delivered himself so nobly on a theme requiring and tasking the higher faculties for its due treatment. He has indeed written eloquently on the sublime.